"This group is formed by Radio Amateurs for Radio Amateurs." NEXT MEETING 4/15/19 7:30 PM AT PROSPECT FIRE HOUSE. Cya there !!! We have a repeater installed at the Firehouse. Bill, W7YY and Jon, WA1PEI installed the former Monroe Repeater. The frequency is 146.835 with a negative offset. The PL Tone is 100.0. !!! 2018 Field Day Results !!! W1LAS had a total of 401 QSOs ( with 7 CW QSOs - Thanks to KB1SL !!). Bonus Points = 250. Total Score = 816 points. Best bands were 80 meters (181 QSOs) and 20 meters (119 QSOs). Many thanks to Bill,W7YY for his hospitality and outstanding help with this event. The Waterbury Amateur Radio Club meets at the Firehouse in Prospect. The Firehouse is located on Route 69 1/8th of a mile south of Route 68 in Prospect. Come to our Monthly Meetings!! The Waterbury Amateur Radio Club meets on the third Monday of each month (Except December) at the Firehouse in Prospect, CT, at 7:30 until 9:00PM EST. The firehouse is located on Route 69 just 1/8th of a mile south of Route 68. Our members do their best to make new members feel welcome. Don't feel an invitation is needed to stop on by. If you have just an interest in Amateur Radio, or you are a licensed amateur, stop on by and introduce yourself. If you feel you need an invitation, send the webmaster an email, and I will personally invite you. 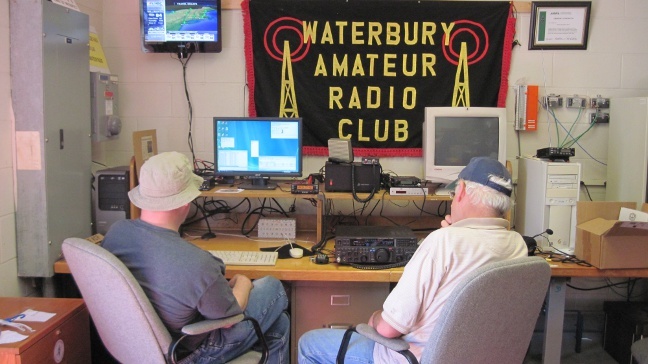 The WARC was established to form camaraderie amongst fellow Amateur Radio enthusiasts serving the Greater Waterbury Area and its surrounding district. The objects and Bylaws of the club are published, and available to view and download here. The club is a vehicle for all to get together and further the interest of Amateur Radio through discussion, presentation, experimentation and training.